Due to exceptional demand for tickets, Cirque du Soleil is thrilled to announce the Auckland season will now be extended until Saturday, March 23. 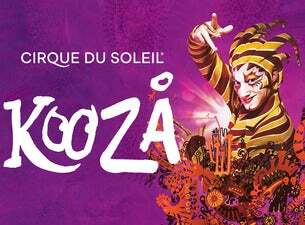 One of the most physically astonishing shows in the Cirque du Soleil stable, KOOZA is a colourful, sparkling homage to the traditions of circus, combining thrilling acrobatics with the art of clowning. The Twin Hire Wire: Two high wires are suspended 5 metres and 8 metres above the stage. The four artists are third and sixth generation circus performers and their expert ability allows them to perform feats in the air that most of us would find difficult to do on the ground, including skipping ropes, sword fighting and standing on a chair balanced across two moving bicycles. Wheel of Death: KOOZA’s 700 kilogram Wheel of Death rotates at heart-stopping speeds, powered only by the two artists who leap and counter-rotate in a death-defying display of fearless acrobatics and astonishing teamwork. The Teeterboard: The Teeterboard is a giant see-saw that literally flings artists into the air, where they execute quintuple twisting somersaults—and that’s just the prelude! The troupe of over 10 acrobats perform stunts of ever-increasing complexity including spinning 9 metres above the stage and landing with double or single metal stilts strapped to their legs. Cirque du Soleil rediscovers its origins with the company’s first Big Top show in Auckland since Totem in 2014. A return to the intimate and fundamental human elements of circus, KOOZA combines thrilling acrobatic performance with the art of clowning. We follow The Innocent as he takes a journey of self-discovery through a comic kingdom of eccentric characters, electrifying thrills and out-of-the-box surprises. Presented in a colorful mélange, KOOZA springs open like a bejeweled toy box to capture the audience’s imagination and set their pulse racing. Sheer human effort - performance in its rawest, purest form - is showcased in all its splendor and fragility. The international cast of 50 acrobats, musicians, singers and actors present heart-stopping feats and laugh-out-loud antics to a live soundtrack fusion of jazz, funk and Bollywood beats. Various Prestige VIP Packages giving access to the best seats and a delectable culinary pre-show experience are available for selected performances of KOOZA. The exclusive VIP suite extends the show’s experience in a unique setting. Passes for a unique Behind-The-Scene Experience comprising of a backstage tour, a meet & greet with the artists and access to all the VIP Package amenities are also available in limited quantities. For more information about individual packages and corporate hospitality opportunities, visit www.cirquedusoleil.com/kooza. From a group of 20 street performers at its beginnings in 1984, Cirque du Soleil is a major Québec-based organization providing high-quality artistic entertainment. The company has close to 4,000 employees, including 1,400 artists from more than 50 different countries. Cirque du Soleil has brought wonder and delight to more than 190 million spectators in more than 450 cities in over sixty countries on six continents.